One of the reasons that we built RapidAPI is to make it easier to call multiple APIs through one console. No more juggling multiple API libraries! We’re starting a series where we smash two APIs together to make a project. Today? We’re putting together GIPHY and Twilio to make “Text A GIF” script that texts someone a GIF based on a user-inputed phrase. We created a “Text a GIF” app that runs in the Terminal. The user types in a phrase and a phone number and the “Text A GIF” app sends a related, random GIF. See below for a demo! Aaaaaand here’s the source code. You can also find it on GitHub. Now, here’s how we built it! The first lines of code call RapidAPI. (If you haven’t already installed it, you’ll be walked through that process when you sign up for a free RapidAPI account). Next, the “Text a GIF” app requires the user to input text and a phone number from the command line. The following lines of code store these user inputs into two variables. Note: In order for Twilio to read the phone number, it must be written in E.164 formatting. All that means is “+” then country code, then number, with no dashes or spacing. For example, +18008675309. The endpoint we used for this app was translateTextToGif. This endpoint generates a GIF based on the word that you type in. You can even filter the results by rating (G, PG, PG-13, R) and language (using the ISO 639-1 country code–English is “en”). Using the translateTextToGiF endpoint, the GIPHY API generates a GIF based on the text the user inputed into the Terminal (in this case, gifText ). If the call is successful, the script will call Twilio’s API to text a MMS with the generated GIF. If the call isn’t successful, the script will read an error message that lets the user know the problem was with the GIF generation. Our next step was connecting to the Twilio API to send a text message. 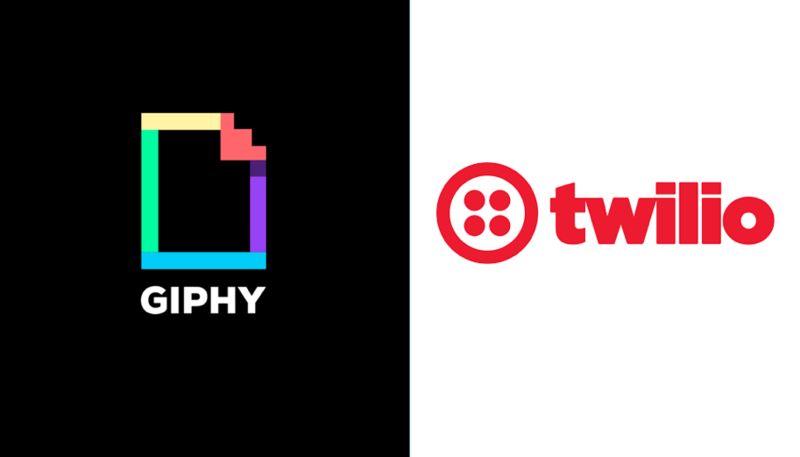 In order to connect to the Twilio API, you’ll need an accountToken, accountSid, messagingSid and to generate a Twilio phone number. These can all be generated for free on the Twilio developer portal. Here’s a quick post on how to get the credentials that you need. Note: If you generate a free “from” phone number with your Twilio developer account, then the phone number you associate with the free “from” number is the ONLY one you can send messages to. In this case, the “Text A GIF” app will only send GIFs to your phone number. In order to send a message to any number, you must purchase an upgrade (see more in the Twilio developer console). For the “Text a GIF” project, we called the sendMms endpoint. Using this endpoint, Twilio can send a multi-media message to the phone number the user entered (in this case, the variable phoneNumber). The GIPHY API translateTextToGiF endpoint returns a variety of data. To store the image URL, we created a variable called gif. (Scroll down through code to display). This article wouldn’t be complete without at least one celebratory GIF. Let us know what you think of this project or the GIPHY API in the comments below. Or give us some suggestions on which APIs we should mash up next! Thanks for dropping by Joseph! Hope this was helpful!